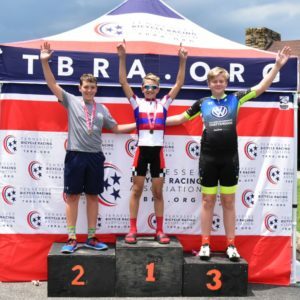 On Saturday, July 21st, Levi won 1st place in the 13-14 Individual Time Trial (ITT) and 1st place overall 9-18 ITT with a 27-second lead over second place. The ITT was unusually short at only 1.35 miles in length with a half-mile climb to the finish. The start was an un-ramped standing start with no hold-assist. Levi arrived to the starting line with a heart rate of 145 beats per minute after a 8-mile warm-up. 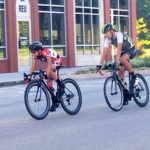 When the race official dropped his hand, Levi flawlessly clipped into his pedals and leapt from the line with a 600 watt sprint for the first ten seconds. As he transitioned into his Merckx aero position, he settled into a 250 watt output at about 110 cadence for nearly three minutes. Over a flat section of the course, Levi’s top speed was 31 miles-per-hour. 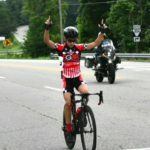 He finished with an uphill sprint to the finish, collapsing over his bars as he rolled to a stop with his heart rate over 200 beats per minute. There were 7 racers competing. The effort lasted for 3 minutes and 41 seconds. Later the same day, Levi won 1st place in the Juniors Open 9-18 criterium race. The 25-minute criterium race was comprised of consecutive 0.84-mile laps, with eight turns in each lap- all on a closed course. With a mass start, Levi was the first racer to clip in and reach the initial turn, creating a gap of several bike lengths. Not wanting to make an early break alone, he sat up and let the peloton rejoin him. Just as the group was settling into a race pace, 16-year-old Jacob Kuper (I Am Racing) made a decisive break off the front. No one in the peloton reacted initially, expecting that they would reel him back in. As the gap extended to nearly 300 meters, it became apparent that he was a threat. Levi and two others launched a counter-attack. As Levi led the three-man chase group, he slipped away and began a solo effort to bridge the gap. He gained on Jacob for three laps before finally arriving at the lead wheel. Together, Jacob and Levi rode away from the peloton, extending their lead to over 70 seconds. With two laps to go, Levi took the front position and increased his effort until the start of the slight up-hill sprint. Levi stood and gave an explosive effort at the line for a 31.5 mile-per-hour win, creating a winning gap of 2 seconds over Jacob. There were 10 racers competing. The average speed for the race was 23.5 miles-per-hour. 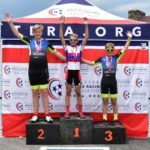 On Sunday, July 22nd, Levi won 1st place in the 13-14 Tennessee State Championship Road Race. The Road Race course was 18.65 miles in length with a climb at the start and another climb to the finish. From the start, Levi and Zach Lowe broke away, creating a decisive lead over the peloton. The two leaders stayed together and stayed away for the duration of the race, alternating the lead and combining their effort. After nearly an hour of consistent effort, at the base of the climb to the finish, Levi launched an all-out attack for about 500 meters. He crested the top of the climb and crossed the line with his hands up in victory. 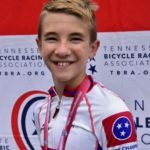 He won the Tennessee State Championship Road Race with no riders in sight! Thanks to Levi’s dad, MicaJon Dykes for writing this exciting description of Levi’s win.